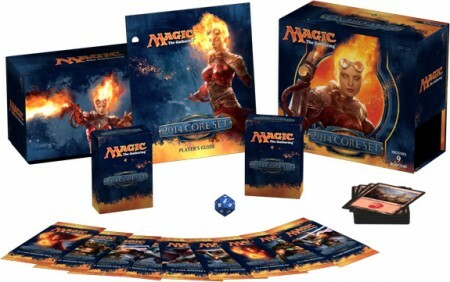 Magic: The Gathering 2014 Core Set, commonly referred to as Magic 2014 is the 15th core set for magic. It will be released 0n July 19, 2013. Even more than the previous set, Magic 2014 is strongly integrated with the digital Duels of the plainswalkers. Prerelease Events take place July 13-14, 2013. Game Day takes place on August 10-11, 2013. With the release of Magic 2014, several rules changes are implemented within the game. The rules changes were subject to a specific article by Sam Stoddard to place them in the context flavor and the rules decision making. Legendary permanents of the same name and Pl aneswalker cards of the same type are now only placed into the graveyard if they are controlled by the same player. For example, if player A controls a Jace Beleren and player B controls Jace, the Mind Sculptor, nothing happens when before both cards would be placed into the graveyard. However, if player A had control of both, that player will choose one of those cards and that card will be placed in the graveyard will the other remains. Sideboards in constructed play now can contain up to 15 cards, rather than the rule of either 15 or 0 cards before. "*this creature* is unblockable" is removed and aligned with other effects to "*this creature* can't be blocked". The rules for playing additional lands off of effects like Explore are streamlined. Planeswalkers: There are at least five mythic rare Planeswalker cards in the set — Ajani, Jace, Liliana, Chandra, Flamebringer and Garruk. Wizard Staves: Each of these uncommon artifacts costs and has an ability that allows its controller to gain one life whenever a spell or land of the appropriate color is played. — Staff of the Death Magus, Staff of the Wild Magus, etc.